Here in Michigan, last week’s Blizzard of the Century earned the same distinction among storms as Student of the Month has among bumper stickers. We never got much snow at all. But then again it’s not unusual for Detroit to get less of what’s expected while the rest of the country gets more. Sigh. 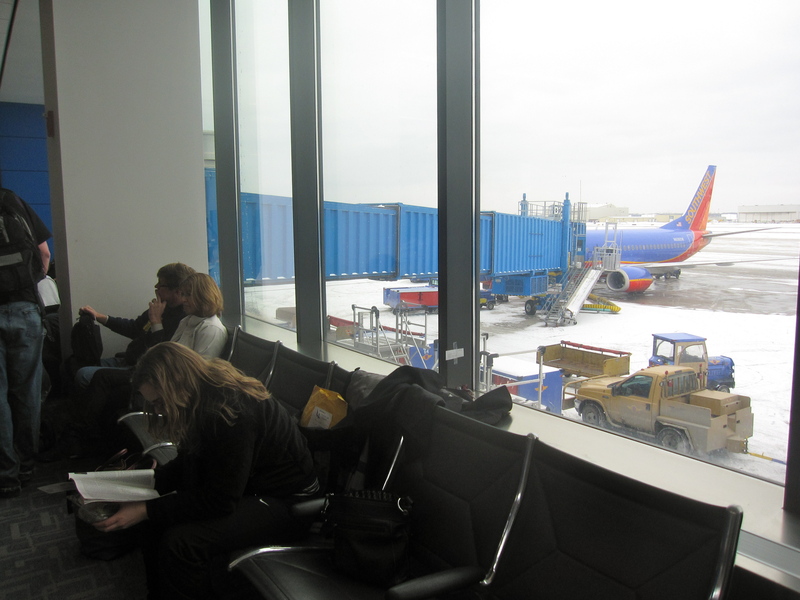 Anyway, the day before the Storm That Dropped Six Inches!, I was at the airport. 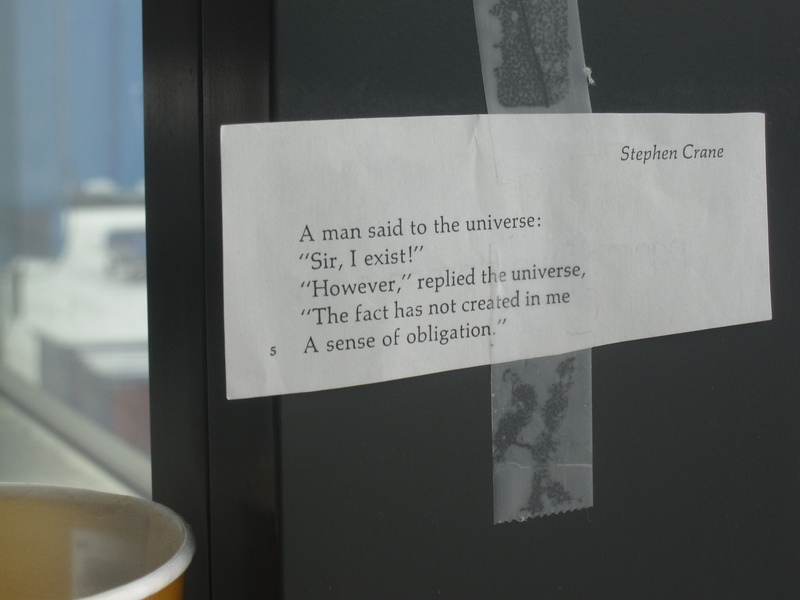 Anticipating travel delays, cancellations, and frustrated travelers to follow behind me, I left Stephen Crane’s poem at the Southwest gate. A poke in the eye, the naughty elf in me thought. If you studied Crane’s short stories “Open Boat” or “Blue Hotel” in high school or college, you probably wrote the phrase “indifference of nature” in an essay. But that’s probably (hopefully) the last you had to deal with the concept. Most of us are protected by enough safety nets that our only glimpse of nature’s indifference is when really bad weather or natural disasters hit. Mother Nature doesn’t care that you have to fly to California for your terminally ill uncle’s 89th birthday party or that you need to get home before your bloated old dog craps all over your beige carpet. Sob stories, saintly intentions, money and connections make no difference when a blizzard arrives. Snow falls on the just and unjust alike, Matthew might have written if he were stuck in Chicago last week. While I don’t share Crane’s fatalistic view of an indifferent universe, I do respond to the equalizer that his universe is, its refusal to grant privilege to those who think they’ve earned it. In my book the only people who deserve special treatment are those who need it, the sick and the old. Crane wrote this poem in his mid-twenties. That’s awfully young to have so bleak an outlook, but the indifference of the universe seems to have been beaten into him. The youngest of 14 children, Crane was small and sickly from birth. His father, a prominent Methodist minister, died when Crane was 8, and thereafter relatives died on him left and right—from train accidents, drug overdoses, and disease—until he himself succumbed to tuberculosis at age 28. But it was an action-packed 28 years, one that no one would have forecast for a minister’s son from New Jersey. He lived with the poor and destitute in New York City’s Bowery, worked as a war correspondent in Cuba, Mexico and Greece, was shipwrecked, suffered from malaria, had a common-law wife who was a brothel owner when he met her, became friends with Henry James, H.G. Wells and Joseph Conrad, and earned fame during his lifetime for his Civil War novel The Red Badge of Courage. It’s hard to imagine too many 28 year olds doing all that today, but maybe I just don’t know that many people. The airport emptied early last Tuesday. Most flights were cancelled shortly after I flew out, and the poem was probably tossed in the trash by a janitor, dare I say, indifferently.